During the past 15 years, access layer solutions have evolved, especially in terms wireless connectivity. Today's wireless connectivity has multiple approaches, each better meeting the specific requirements of organisations through a choice of different architectures. Whether its a refresh, redeployment, change of application or a brand new site, there are a lot of options. During this webinar we’ll examine different approaches and how to apply them to different verticals or deployment scenarios. As wireless connectivity continues to evolve, we will also look to the future and see how trends in new hardware can provide cutting edge solutions to meet the potential needs of tomorrow's organisations. 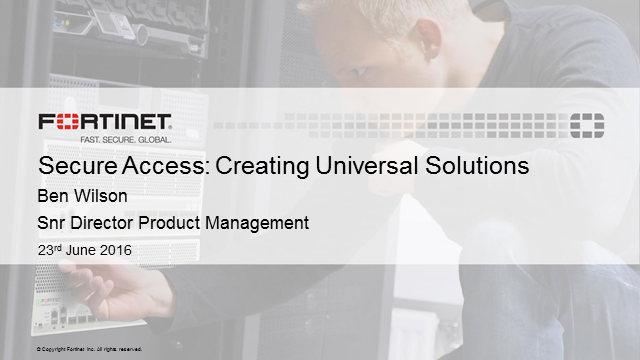 The presentation will end with an overview of Fortinet's Secure Access Architecture and how it can meet today's and tomorrow's wireless requirements.